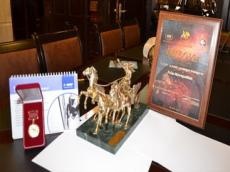 Ceremony of presentation of the international “Golden Chariot” transport award was held in Tel-Aviv, Israel. Baku Metro was also honored to this high award. The Baku Metro was chosen as the “Leader of Public Passenger Transport” for ensuring good passenger transportation, as well as realization of efficient projects to raise safety service. The Award was presented to the chief of Baku Metro Tagi Ahmadov. The awards were presented in 15 nominations.